I’ve always felt more connected to the Chinese New Year than the one that falls on the Gregorian calendar. The lunar calendar seems like more of a blueprint for the year ahead, complete with assigned symbols of animals, elements, forecasts of luck, pitfalls to watch out for and more. While I’m not one to live or die by astrology, I must admit that even a cursory glance at the past few years show definite correlations between the energetics of the year, and what actually happened in my life. In 2019, we enter the year of the Earth Pig. Given that the Chinese Zodiac follows 12-year cycles, it compelled me to look at where I was 12 years ago, and where I am today. 12 years ago, there were some seriously profound new beginnings for me. And while it wasn’t my ‘native year,’ a brand new part of me was born. Within the first lunar cycle, I became a mother. My son was born in March of 2007, and now faces his first “return” year as a pre-teen (pray for me!). In addition to transitioning out of my maidenhood, I made a huge leap in my career when I received my acupuncture license and started a private practice. Over the last 12 years, I feel as though I’ve raised 2 children from infancy, my boy and my business. So far so good, on both fronts! The lunar new year gives us an opportunity to reflect on the influences in our lives from the prior year, and to consider how we will harness the prospects of the year ahead. Because the pig is the 12th and final animal in the Chinese zodiac, the year marks the end of a 12-year cycle for all of us non-pigs as well. Pigs are symbols of wealth and fortune. 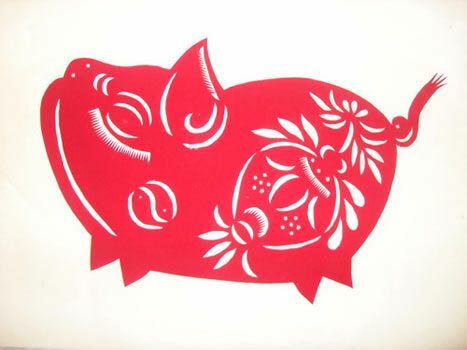 Ironically, according to Chinese Folklore, being in your native year in is the least auspicious time in the 12 year cycle, so while the Pig may symbolize wealth, people born in the year of the Pig will have the most difficult time during this lunar year. Luckily for my kid, he doesn’t pay the bills yet! Of course, fortune can come in many forms, so this year is a wonderful opportunity to focus on the things in your life that you desire the most. According to Chinese astrology, 2019 is a great year to make money and to invest! 2019 is forecasted to be full of friendship and love for all of us, and an auspicious year because the Pig attracts success in every aspect of life. How do you plan to harness the energy of the year of the Pig? As a motherless daughter, I can attest that the strong women in my life have been my personal saviors. Having lost both of my parents before finishing college, I am no stranger to feeling un-rooted, lost and in search of a sense of belonging. I am blessed to have an amazing support system around me, but I have had to work for it, with intention and consciousness. The people who I have chosen as my tribe include, family, friends, friends-turned-family, and many have been beloved care providers. I am grateful that my life’s work has evolved to serve and nurture women, as this work is merely a mirror of what I have come to understand as a necessity to thrive in my own life. I frequently think about the way that our society has evolved to accept isolation as the norm, rather than cherishing community, connection and care of one another as our highest priority. The word doula is translated as “to mother the mother,” a concept that permeates virtually all traditional cultures across the globe. Yet somehow, here in the west, we leave each other to muddle through alone, often with only a virtual connection across the miles. It is my intention to continue to work towards a day when we accept no less than a better paradigm for ourselves, our communities and our children. Until then, I will be here, offering to Mother those who need it, Nurture those who will accept it, and nudge us all to a state of optimal Wellness, in community.